However, I'm using this outdoors downtime as a stretch wherein to plan this year's garden. I had planned to just sketch it out on paper, do a little plant research and just go, but thanks to a couple new garden-planning-for-goons sites, I think I'll take the more detailed approach. In the past few days, I've signed up for two different sites that are meant to help even the most novice gardener start out on the right foot: SproutRobot and SmartGardener. I signed up to both (free) programs on Monday, and will compare how I feel about them in the beginning stages today. My future sister-in-law (which is still kind of wild to think about) pointed out this user-friendly, no-frills site to me over the weekend. Once you sign up, you simply submit your zip code and then pick a few different plants you're interested in growing in the Spring and Summer. From there, it provides you with a weekly list of when to start which plants, when you should see the plant sprout and their estimated harvest date. The site also provides instructions for planting and caring for each crop. 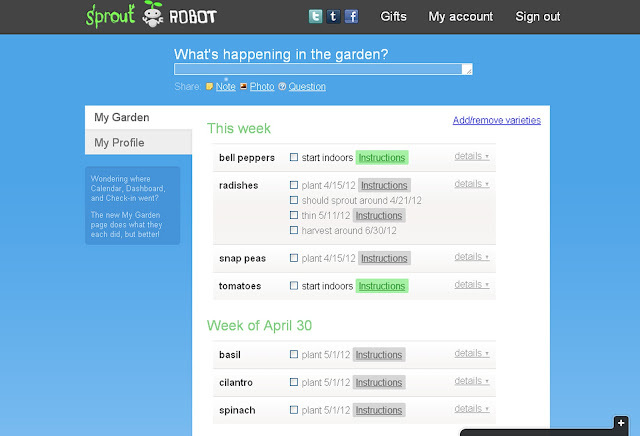 I really like how simple and straightforward SproutRobot is. As you can see above, it's telling me that I am able to plant radishes and snap peas in my garden this weekend, and I should start bell peppers and tomatoes inside at the same time (it also tells me when I should transfer those plants outside). Then I've got a couple weeks to go before planting basil, cilantro and spinach... and so on, and so on). 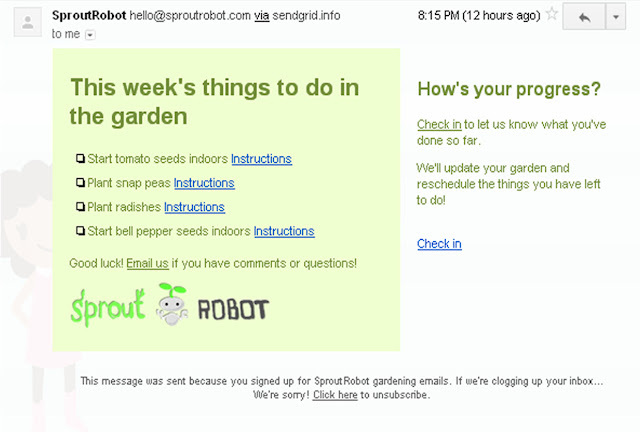 At the same time, last night I received an e-mail from SproutRobot giving me my weekly "to-do" list. I absolutely love this reminder, as I'm sure I'd forget to check back into the site every week or so. 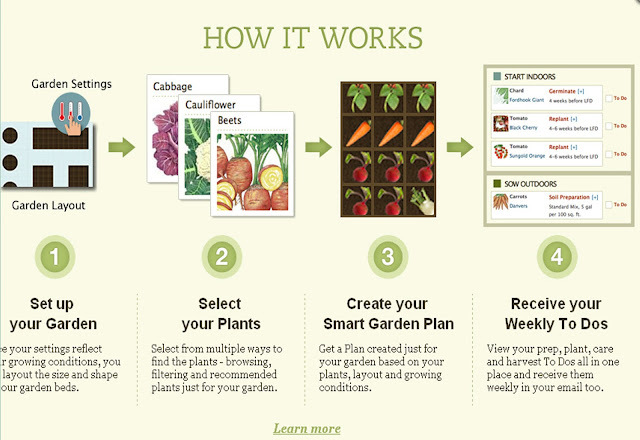 I stumbled across SmartGardener on (where else?) Pinterest. SmartGardener takes SproutRobot's idea and makes it incredibly tailored to your specific location, weather patterns, size of garden and more. In fact, it had so many options I didn't specify a few of them (last frost date and first frost date of the season?) as I was signing up. You've always got the option of adding more detail about your garden later, so I may update that after some research. Although a bit overwhelming, the site is very cool. I love that it provides you with plant recommendations (right down to all the different varieties of a plant - like the 38 different kinds of lettuce they show you), and you can even purchase seed packs straight from the site. Aside from building your own virtual garden, the site provides budding green thumbs with plenty of successful-garden tips. 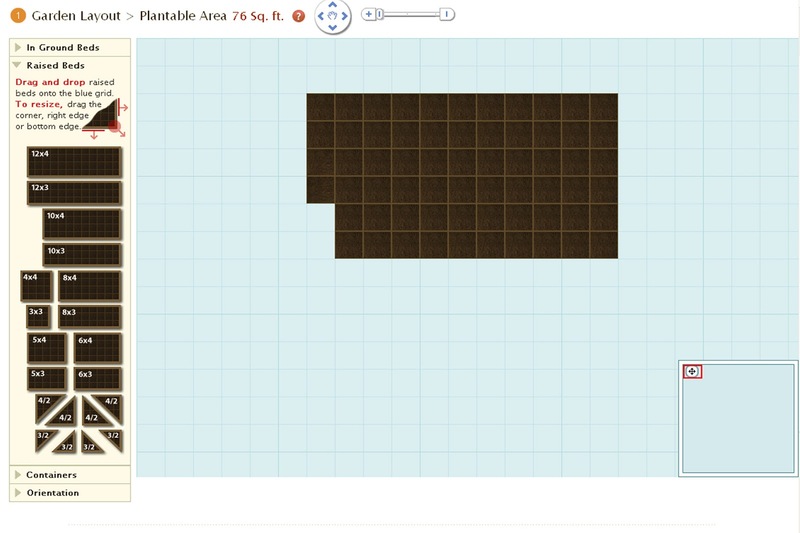 You also build a virtual replica of your garden right on the site, itself. Choose between in-ground beds, raised beds and containers, and then create a to-scale bed right on their site (I did an estimated dry run last night, but plan to head out with a tape measure to get my raised-bed garden's actual dimensions tonight). As you add plants to your virtual garden, it will plot them out according to the garden's orientation (where it faces North) and tell you how much square footage you've got left to work with. With all the options to take in, I'm still learning more about this site as I go. I do know they'll also provide me with a weekly to-do list, as well. However, According to SmartGardener, I don't have anything to start in my garden for another couple of weeks. SmartGardener is great for offering incredibly precise details about your specific garden, and if you have the patience to sort through their super-detailed start-up guide, I'm sure the result is a no-brainer guide to a perfectly successful garden this season. My preference right now is SproutRobot, just because it's incredibly easy to use, simple to follow and I'm getting just enough information to make sure I'm planting things correctly, but not oversaturated to the point where I have no opportunity for learning-by-doing in the garden. However, once I really familiarize myself more with SmartGardener, I could see how it could be an awesome tool and, ultimately, a garden-saver. 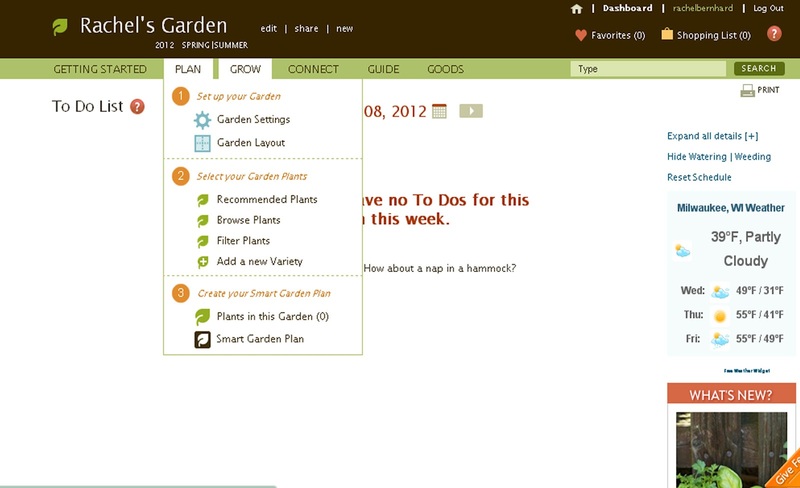 I know there have got to be so many more online tools like these to help gardeners produce their best crop. Do you know of any others that you love? When are you planning on starting your garden this year? Today's color in manolo blahnik outlet Brynn's gorgeous color series is yellow! And upon further investigation of my cupboards and closet it turns celine luggage out I have very little of this sunshiny color. I must fix that. The top board is a collection of things manolo blahnik online that I found around my house (yes Mila, I stole some of your toys for this photoshoot), and the bottom one is a few lovely yellow items that I wouldn't mind adding to my wardrobe. I've seen this trend celine outlet gradually grow from nostalgic letter jackets to full out Alexander Wang mesh dresses via my Neiman Marcus feed. A trend celine bag sure to hold some popularity due to the comfort it provides its wearer and fresh feel that celine handbag can easily be kept feminine with the right accessories.Before I delve into celine outlet the book though, I went to the ridiculously lush n' plush penthouse suite at the W London Hotel where celine bags AH antics have been going on all day and will go on late into the night. I've never seen a freestanding double basin island in a hotel bathroom before but this facilitated the WAH girls to set up a mini nail salon, complete with an MTV Cribs-style jacuzzi in the backdrop. I'll be celine bags disappointed if people don't take advantage of the tub and end up there with geysers on full blast and champers flowing.